A spring balance, a clamp stand, two different solids, such as metallic brass bob and rectangular block, overflow can, tap water, strongly salty water, a strong thread and two empty beakers. According to Archimedes’ principle, when a body is immersed in a liquid, completely or partially, it loses its weight. The loss in weight is equal to the weight of liquid displaced by the body. = Weight of liquid displaced. 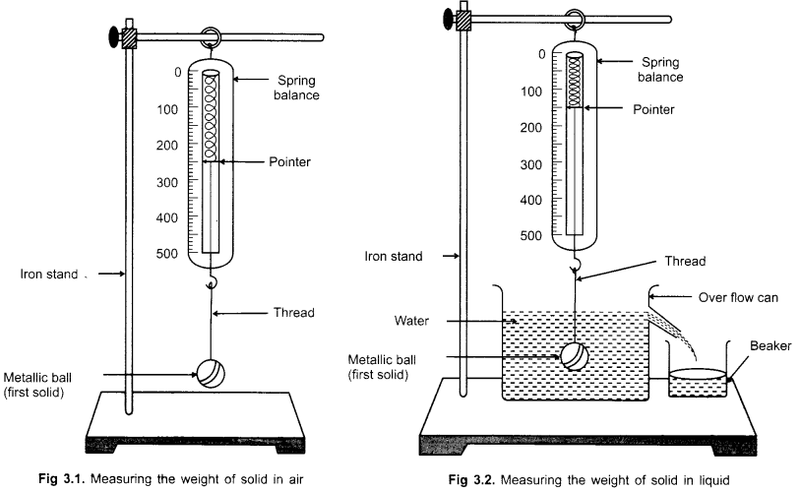 Measure the weight of a solid, say a metallic ball in air by using spring balance as shown in Fig 3.1 and as per procedure explained in Experiment 2 of Term II. Weigh the empty beakers using spring balance. 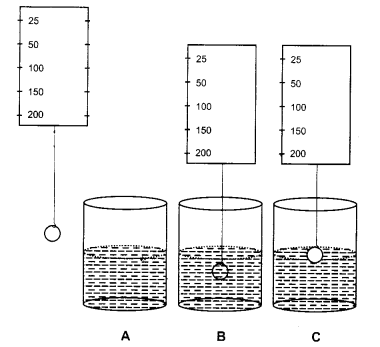 Set the spring balance, overflow can with tap water and beaker as shown in Fig 3.2. Now, allow the bob to immerse completely in water in overflow’ can. Note down the new position of pointer of the spring balance. This will give you the weight of the brass bob in tap water. Weigh the beaker containing displaced water which is collected from the overflow can while immersing the bob in it completely. Find the weight of displaced water by subtracting the reading of step (2) from step (6). The weight of liquid displaced is equal to the upthrust. Therefore, the weight of displaced water would be equal to the loss of weight in the brass bob. Repeat the above steps two more times with the same brass bob after drying up completely. Tabulate your observations in Table A. 9. Take a beaker of capacity 500 mL and pour 300 mL of tap water into it. 10.Dissolve the common salt (known amount) by stirring with the help of a glass rod till the saturation state of the solution. 11. Again take the same solid body (i.e., brass bob) and repeat the steps from (1) to (8) with strongly salty water. 12.Tabulate your observations in Table B. Take a different solid body such as a metallic rectangular block given by your teacher. Repeat the experiment in the same manner as done for the measurement for the apparent loss of weight of brass bob in tap water and salty water. Make a separate table for the second given body similar to Tables A and B.
Repeat the experiment for two more times. Zero error of the spring balance, e -= …………… g wt. Least count of spring balance = …………… g wt. Range of spring balance = …………… g wt. Weight of empty beaker (Wb) = …………… g wt. The apparant loss in weight of solid immersed fully in liquid (tap water and salty water) is equal to the weight of liquid displaced by that body. This also proves Archimedes’ principle. The zero error (if any) of the spring balance should be noted accurately. A stable, sensitive and zero error free spring balance should be used. Solid body should be immersed fully in tap water/strongly salty water not partially while taking the spring balance reading. Solid body should not touch the side or bottom of the overflow can. There should be no air bubble present inside the water or salty solution while immersing the solid body. Care must be taken while solid body is allowed to immersed in tap water/salty water so that tap wafcet&alty water does not splash out. When a body is immersed in a liquid, completely or partially, it loses its weight. The loss of weight in a body is equal to the weight of liquid displaced by that body. Why does a body loss its weight when fully/partially immersed in a liquid? Body experiences an upward force on immersing in a liquid called upthrust or buoyant force. As a result, a body experiences a loss in weight which is equal to the weight of liquid displaced by that body. Name the phenomena given to it. The upthrust exerted by the liquid on immersed solid body is called buoyant force. Name the two forces which act on a body when it is immersed in a liquid. The weight of the body acts vertically downwards. The upthrust on the body due to liquid vertically upwards. What is the volume of liquid displaced by a body? The volume of liquid displaced by a body is equal to the volume of the body. How can you measure the observed weight of the body in a liquid? Observed weight of the body in a liquid = True weight – Weight of liquid displaced. What happens if the density of the object placed in a liquid is equal to the density of the liquid? The body will float and remain suspended in liquid as the densities are equal. Name the scientist who says that weight of liquid displaced and upthrust are equal. If the same solid body is weighed in two different liquids having different densities, equally immersed in them, in which liquid loss in weight is more? The loss in weight is more in denser liquid. Note: For further viva-voce, students are advised to go through the interactive session of Experiment 2 (Term II) also. Why is it easier to swim in sea water rather than in swimming pool or in river water? The liquid having higher density exerts more upward buoyant force on the object than the liquid having lower density. Sea water has the higher density, therefore, sea water will exert more buoyant force on the immersed part of the swimmer’s body. So, it is easier to swim in sea water. In which liquid glycerine or kerosene the loss in the weight of a solid object when fully immersed in it will be more? For a given solid object, the loss in weight will be more in glycerine as compared to kerosene as the density of glycerine is more than the density of the kerosene. 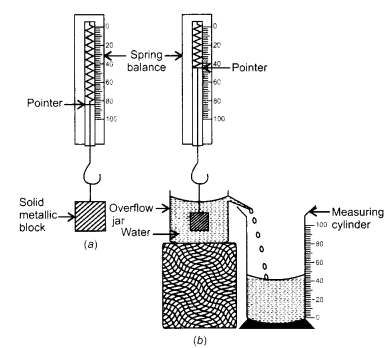 Loss in weight of solid object = Weight of liquid displaced = Volume :c Density of the glycerine. How can you perform this experiment for a solid whose density is less than that of the liquid used? If the density of any solid object is less than that of a liquid used. Then a sinker, i.e. a weight which is used for sinking the solid object can be used to perform the experiment. What are the limitations of this experiment? The graduation marks on the two spring balances used in this experiment may not be evenly spaced. 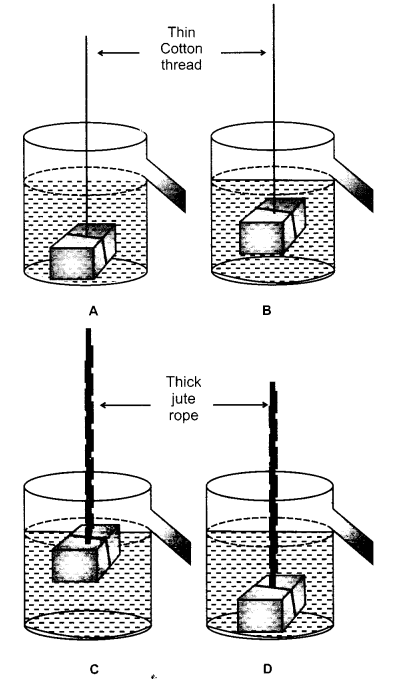 The thread used for tying the solid object in this experiment may also absorb some water which will cause some extra error while taking the observation. The impurities present in tap water may alter the density of water. Using this method, how would you find the density of a liquid? How will you select solid to perform this experiment using glycerine instead of water? The density of the solid should be larger than that of glycerine so that it sinks in it. Why does the pointer of a spring balance move up when the stone suspended from it is immersed in water? When the stone suspended from the spring balance is immersed in water, the pointer of the spring balance moves up due to the apparent loss in the weight of the body. State the factors on which buoyant force acting on an object immersed in a fluid depends. What will be the effect on the apparent loss in weight of a stone if it is immersed in salty water instead of tap water? For a given solid, i.e. stone, the weight of water displaced by it when immersed in salty water is more than the weight of water displaced when immersed in tap water(Adding salt to water increases its density). State two precautions that should be taken while making use of an overflow can. It must be ensured that the level of water in the overflow can is upto its brim. The overflow can must be kept on a horizontal surface of wooden block which should also be kept on a horizontal surface. 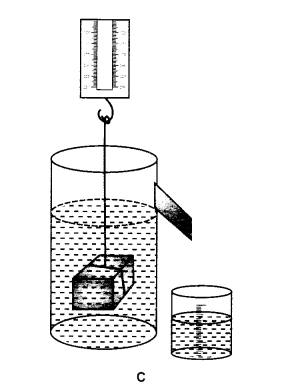 An object suspended from a spring balance is gradually lowered into an overflow can. What will be the change in the apparent loss in the observed weight as the object is immersed in water? The observed value of apparent loss in the weight of solid object gradually increases as the object is gradually immersed in water. When it is completely immersed in water, it is equal to the weight of displaced water. What is a fluid? Is it different from a liquid or from a gas or a solid? Fluid is a substance which can flow. Since liquid and gases can flow, hence they are called fluids. It is a property which distinguishes fluids (i.e., liquid and gases) from solids. (d) equal in all the three cases. 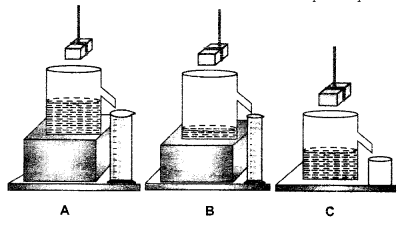 Four students A, B, C and D while performing an experiment on establishing the relation between the loss of weight of small solid when fully immersed in tap water, and the weight of water displaced by it, used four different shapes of overflow cans containing water as shown. Three students used three different containers (A), (B) and (C) of different shapes, for finding the loss in weight of solids when dipped in water. For performing an experiment to verify Archimedes’ principle, a student used a spring balance with a zero error of 4 gwt. 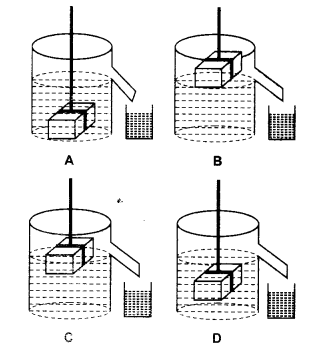 He used to measure the weight of a solid metallic block as shown in the figure below. 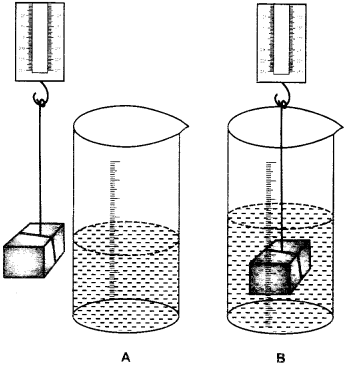 The solid metallic block was then lowered in water contained in an overflow jar and the water displaced by this block was collected in graduated or measuring cylinder as shown in figure. (d) more in the denser liquid with same volume displaced. 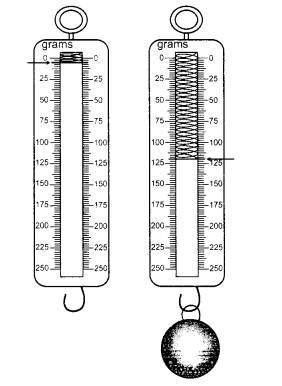 (i) noted the salty -water level in the measuring cylinder without solid body. (ii) immersed the solid body completely in salty water. (iii) noted the rise in salty water level in the measuring cylinder with solid body. (iv) weight of the displaced salt solution collected in the beaker was not recorded in the observation table. (d) all the four steps. (d) it is completely sunk and settles on the body. (a) equal to each other in all the cases A, B and C.
(b) equal to each other in cases A and C only. (c) equal to each other in cases B and C only. (d) different in every case.